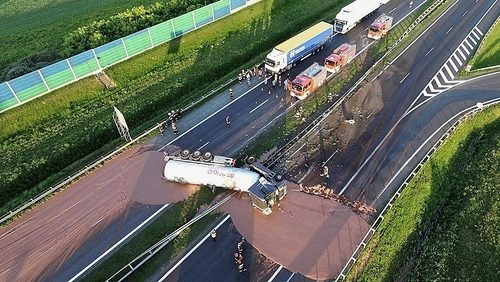 A lorry carrying 12 tonnes of liquid chocolate overturned on a motorway in Poland. The spillage covered six lanes, blocking traffic in both directions. Local police said it was unclear why the lorry hit the central reservation on highway A2 between the western towns of Wrzesnia and Slupca. Passing vehicles left chocolate tyre marks across several kilometres before authorities closed down the road. The driver of the truck was hospitalised with a broken arm.